U.S. Central Command Commander Gen. Joseph Votel speaks at a Senate Armed Services Committee hearing on Capitol Hill, Feb. 5, 2019. 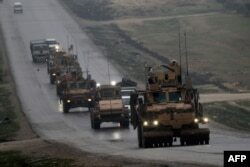 FILE - A convoy of U.S. military vehicles is seen in Syria's northern city of Manbij, Dec. 30, 2018. 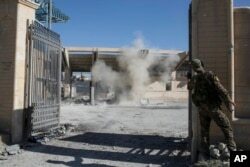 ​"Absent sustained [counterterrorism] pressure, ISIS could likely resurge in Syria within six to 12 months and regain limited territory," the report said, using an acronym for the group. FILE - A member of the U.S.-backed Syrian Democratic Forces throws a bomb to check for more explosives as they clear the stadium that was the site of Islamic State fighters' last stand in the city of Raqqa, Syria, Oct. 18, 2017.